Tuesday. 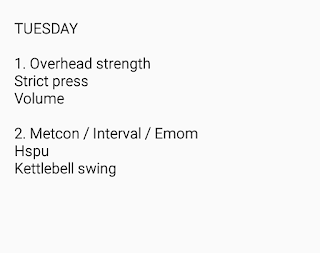 Shoulder press e2mom x 30min. Emom x 18. 1st: 7-10 hspu, 2nd: 12 kb swing (32kg), 3rd: rest. It would be an understatement to say my hip flexors are on fire. Had to be careful with today's training session not to burden those areas too much. That's how it turned out to be strict press and emom conditioning piece in the end. The plan for this took shape during the session itself. Started with triples at 60kg. That started to get challenging but I wanted to continue pressing. Decided to take 5kg off the barbell and add one more rep. Continued this for another 10 minutes, and repeated the same protocol for the last third. My shoulder took hit on this one. It really fatigued them as planned! It was 7-10 reps per minute, changing a bit by the minute. 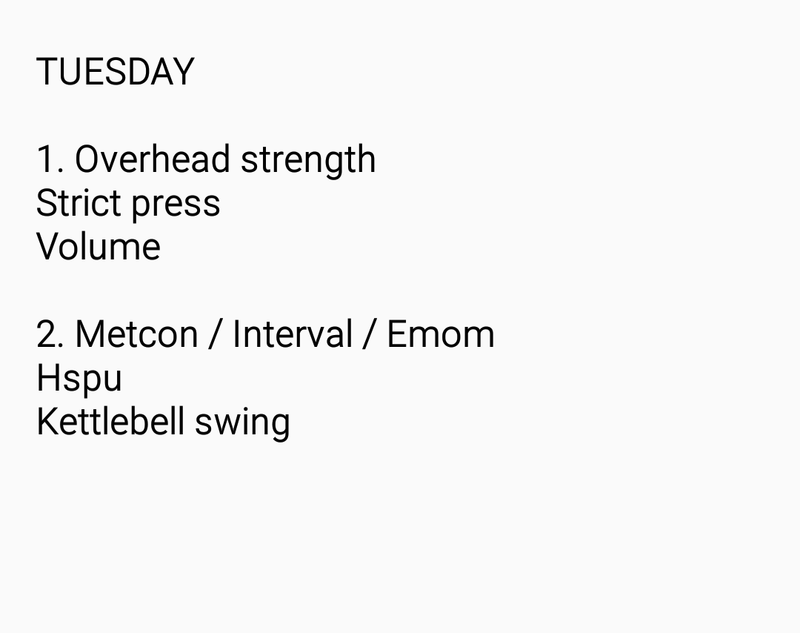 It was just too much to hold on to 10 reps. Couldn't do them unbroken anyway, except the first round of 10 reps. Kb swings were much more easier to handle. I needed that extra minute recovery before going for next round of hspu's.